The Obama fanatics can keep their Marxist mass murderer. The brave Iranian student activist who was sentenced to death and who was severely tortured for years in the notorious Evin Prison in Iran has arrived safely in the United States! Ahmed Batebi is the Iranian student who gained international fame for his appearance on the cover of The Economist magazine holding up a bloodied shirt claiming to belong to a fellow student beaten by the Basij paramilitaries. The photo, which has been called “an icon for Iran’s student reform movement,” was taken during the Iranian Student Protests in July 1999 in Tehran. Human Rights activist Shirin Ebadi, reports that the shirt belonged to Ezzat Ebrahim-Nejad, a student who was shot and killed reportedly by a plainclothes police or vigilante. Ahmed Batebi was imprisoned and tortured for years. He escaped the regime traveling through the Democratic Iraq and Austria before arriving in Washington DC this week. Again… This is a MAJOR BLOW to the brutal Iranian Regime! Winston and Aryamehr have more on this courageous man. WELCOME TO AMERICA AHMED BATEBI! Thank you again, Banafsheh Zand-Bonazzi for this wonderful news! 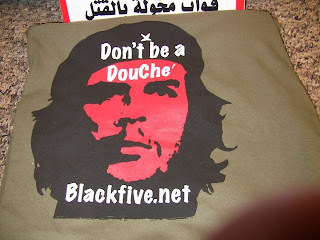 Related… It was a rough week for Che fans, with the Colombia rescue and all.